Take Heed ....Fear and Dismay.....no more~~! So many people are apprehensive with all that is on the news...wars and wars and rumors of war, killing in the streets, hunger, fleeing...and the list goes on. When they think of their own lives, the uncertainty and the reality of finances and debt, illnesses, and family troubles surface. Joshua was also apprehensive. We as Christians need to take heed to Moses advice for Joshua. We need to encourage each other in these trying days. It is normal to be fearful when you have no hope, but we have hope in the Name of Jesus. Read His word, pray, receive the comfort He is ready to give. God has a plan for each of us. God's plan for your life is probably different than someone else's. So if you want to live like someone else, you have it all wrong. Because you are unique, He has a plan for you. Pray, ask Him to lead and guide your life. I am a sinner. I believe you was born of a virgin, died for my sins on the cross and rose again. I ask you now to forgive me and come into my heart and be my Lord and Savior. If you did this, your name is now written in the Book of Life, sealed by the blood of Jesus. Now, you too can live your life without fear or dismay~! Let someone know if you prayed this prayer for the first time in your life....or prayed it rededicating your life to Christ. He is the Great I am!! He is our Father...He loves us enough to discipline us! Driving in town today, I saw a stout, muscular man (that looked like he could played NFL football!) walking along and holding, very carefully, a tiny puppy. I thought it looked unusual, but then I smiled as I looked through the mirror at how carefully he was holding the puppy. The man may look like he could whip anyone in town, but he had the compassion to protect the puppy from the danger of the busy highway. 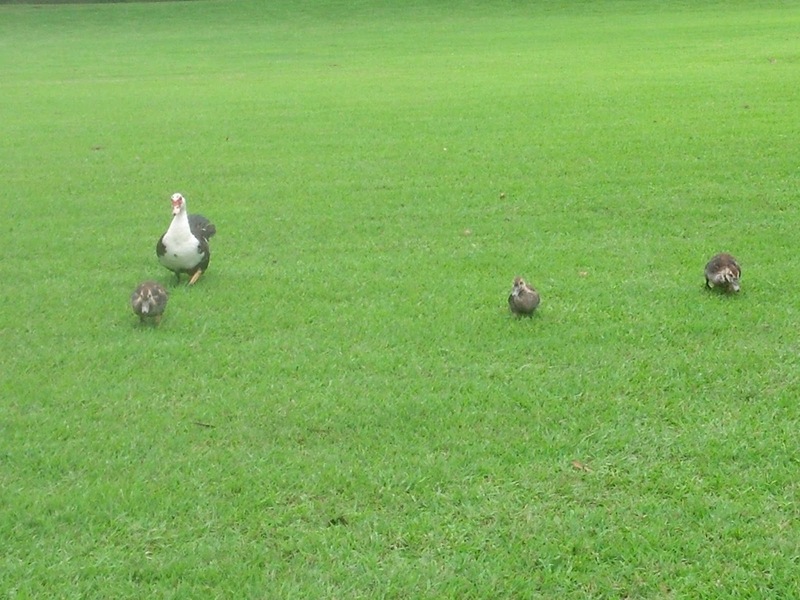 Then, I saw the mother duck and her babies, waddling across the grass. She was pushing them to hurry across the lawn, to protection. I thought of God. Yes, He is like both of these caretakers when it comes to us. I think we will be amazed when we get to heaven and find out all the many times He protected us from danger, physical and spiritual. But think of these little animals, as they were in the arms and care of their owner they were safe. As we are when we are in the right relationship with Christ. However, if the puppy or the baby ducks had drifted away, what do you think would have happened? We all know the owner of the puppy would have scolded it, for its own protection, maybe even smacked it's hinny...because he loves it enough not to want to see it be hurt. The same way with mama duck, she quacks her heart out when the ducklings do not follow her into the water. She is aware of the dangers that lurk on the land. She loves them. Discipline....yes, because He loves us. We actually choose it ourselves. When we are disobedient to God, He has no other choice but to do what is best for us. Wow! How hard is that to accept? He wants to bless us and we sometimes run the other direction...then we complain how hard life can be. I am not saying life is always the result of disobedience, but we must admit, sometimes it is because of our own choices we have made. Life is hard enough, we live in a sinful world. Let us choose to live for Christ, to have the power, the shield of armor of His word, to protect us. He would love nothing more than to never have to discipline us, but to hold us in His arms of protection...just like a puppy being cared for on a busy highway. School has started once again. I am sure some of the parents, students and teachers began this year with apprehension like none other. This past year we have seen some horrific incidents on our school grounds; the shooting at Sandy Hook and then the children in Moore, OK tornado. In both of those, there were 20 innocent children killed, not counting the adults. Hearts across the nation still mourn for those victims. I am sure, as they all returned to school, they were full of mixed emotions. That of excitement to get back to some kind of normalcy and that of fear. People asked, "Where was God?" Yes, we have heard 'we took Him out of the schools'. However, I know without a doubt, God was in the schools. We may not be 'allowed' to pray aloud 'within the walls or on the grounds', but we can pray where we are silently. God heard many prayers those days. He loves our children. Matt 19:14 'Let the little children come unto me' tells us Jesus loved children. He does not want harm to come to them or anyone else. But we do live in a world full of evil and pain and disease. A sinful world because Satan is alive and wants to hurt and destroy that which is good. Therefore, we must stand firm in our faith, praying everyday for the protection from the evil one. Read His word, share it with our children....teach them to pray. Please post your comments below, say a prayer, encourage each other! Bless you! God Answers Prayers, even after we are gone? That profound statement hit me 'God answers prayers, even after we are gone'. Then, as I think back, I remember my Mother (people called her Ducky!) praying for hours, the week before she died, for everyone she had ever met. Her prayers were especially for her children and grandchildren (she passed away before any of my children were born). But, God knew and saw the lives to come...and He has not forgotten her prayers. 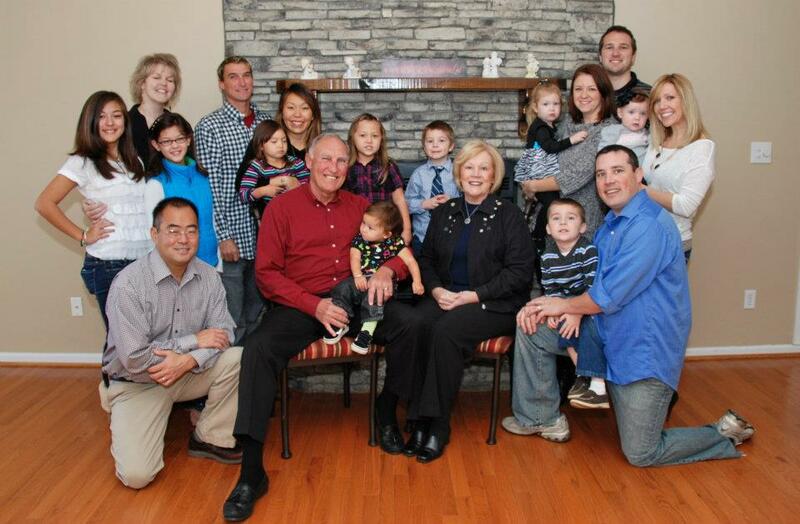 All of her children, and grandchildren have accepted Christ and continue to serve Christ. Now, as her great grandchildren are growing up, they have accepted Christ and are baptized. You see it is never too late (or early) to pray for someone. Time passes quickly and we may not see the results, but God hears and answers prayers. He knows our hearts and hears us when we cry out to Him. Don't give up on a loved one. Some have asked for prayer this week on specific things, wisdom and direction in their lives, finances, sick family members, addictions...those prayers have gone up...and I believe with all my heart and soul, He heard and will answer those prayers. I may not ever know the answers or see the answers while I am here on this earth, but that does not mean our Father in Heaven is not working on them. You see it is not the prayer warrior who is in the miracle works or the business of answering prayers, but the Holy Father....and it is in Him we trust and have faith. Won't it be glorious in heaven when we have eternity to hear all the 'rest of the stories' from those we prayed for? I think my sweet Mother will rejoice when she gets to meet, face to face, her grandchildren and great grandchildren that she prayed for over 45 years ago on earth (some of which she never met!). Keep praying, never give up. God is the One True God, He is in control and let's continue to Praise Him and give Him honor....even when we don't immediately see the answers. For you see, He already knows the 'rest of the story'! Ginger Sanders, BGEA RRT Chaplain: Who is Your Master and Provider? Who is Your Master and Provider? Sitting here in the South Carolina country side, watching my grandchildren play in nature. 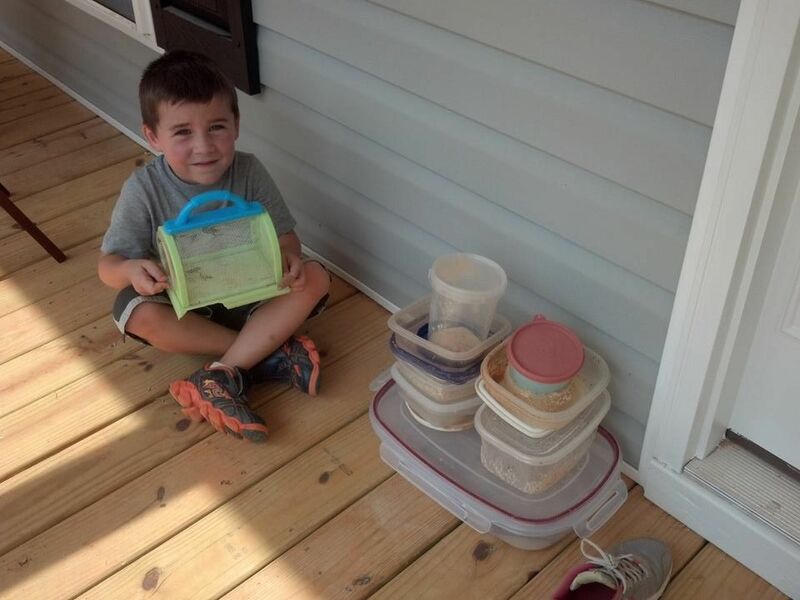 My grandson loves bugs and has used all of his mothers plastic dishes to use as 'bug houses' on the porch. He feeds them left over breakfast muffins (not sure how much they like the chocolate chips and blueberries!) But, he is their master and he provides for them. He will take care of us, our needs. We just need to look to Him in obedience, service and give Him Praise. To do this, we must have our hearts in tune with Him and have a relationship with Jesus. It is a simple process, but oh, how hard it is to trust and have faith!! Try it, let go and let God. His plan for you is much better than anything you can come up with on your own. Give Him honor and glory and look for His blessings today as you go....then when night falls, look back and see when He was there with you and praise His Name. Wow! Where has summer gone? This is August already? Really? This is sort of the way life is....fleeting through....sometimes sunshine, sometimes rain and occasionally a cloud or just a spotty shower. Have you ever thought about that is the way life and our walk with Christ is? Sometime, we feel really close to Him and we have peace and joy and sunshine in our souls. But, then, sometime...we feel He is so far away and the rain (tears come) and we wonder where He is....Then, on occasion, we know we should not do something and oops, we mess up and we know it....and we have a cloud or spotty shower. Why are we like the seasons? I don't want to 'fleet' through my life like the weather map and have storms and hurricanes. I had rather have the lazy, hazy days of life. Really, we cannot control the weather, but we can have a little control of life. If we set our site on Christ, live the abundant life He wants us to have, it will be like having an umbrella over our head for those spotty showers. He is always there for us, even when we mess up, He is quick to forgive if we ask. How can we be prepared for life itself? Easy....listen to the weather forecast He has written for your life. Everyday life is as different as it is with weather. Watch out for the clouds, look for the sunshine in everything. Is there someone placed in your life for you to share His love with today? Let them borrow your umbrella? Tomorrow, when you get up, think of your weather map for the day. What does God have in store for you and see how you need to be prepared. Get ready, it may just be the most Sonshine that you have had in awhile!! I would love to hear from you and you to share with me about your days ahead. You can contact me at gingersanders.com or you may comment here on my blog.